Changes have been made to the Lotto Plus games so as to increase the prize money on offer. These are the first changes to Lotto Plus in sixteen years and the result has been that the top prize has doubled to one million euros. Unlike when you buy a regular lottery ticket in the shops, with Lottoland you can place one line bet for €3 instead of having to buy a minimum 2 lines for €6. The Irish Lotto has long been a favourite with lottery fans from all over the world thanks to its generous jackpots, friendly odds and the fact that you can opt in to two lucrative bonus games for a small extra supplement. Since the first of September, the cost of playing Lotto +1 and Lotto + 2 has risen from 50 cents to a euro, with the €2 price of a line in the main Irish Lotto game staying the same. Nobody likes to see the price of entering the lotto increase, but in this case there is a considerable silver lining. The top prize on offer from the Lotto Plus 1 game has doubled from €500,000 to €1 million, meaning that there will be a lot more Irish Lotto millionaires over the coming months and years. Why Bet on the Lotto with Lottoland? The main Lotto game remains unchanged, both in terms of the jackpots on offer and also the cost of placing a bet with Lottoland. One line bet costs €2, although if you are one of the 90% of people who choose to bet on the Lotto Plus games as well thanks to their great value, the price to have a bet on all three lotteries will be €3. When you buy a lottery ticket in Ireland you must buy a minimum of two lines. This means that the minimum price you pay to enter the Lotto with Plus draws is €6 in Ireland. Fortunately, we like to do things differently at Lottoland. Bet with us and you can go for just one line if you want, meaning that you can pay €3 to bet on the Lotto, Lotto Plus 1 and the Lotto Plus 2 draws. Three separate lottery draws for just three euros is pretty hard to beat! Around €10 million in Lotto prizes goes unclaimed every year, due to people losing their tickets or not bothering to check to see if they have won smaller prizes. 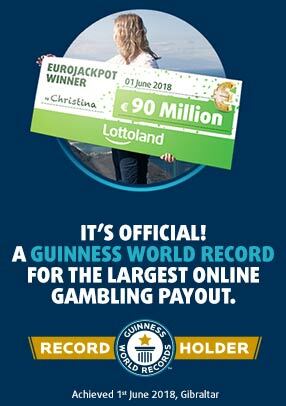 Bet with Lottoland and you won't be part of that sorry statistic. We credit your accounts with your winnings as soon as the drawn balls have been confirmed, and we also notify you by email that you have won. Now you've got two chances to become a millionaire with the Lotto, so what are you waiting for?